Dye sensitized solar cells are low cost thin film solar cells based on a semiconductor formed between a photo-sensitized anode and an electrolyte (photoelectrochemical system). The Grätzel cell is an example of a dye sensitized solar cell. Gratzel cells are named after Michael Grätzel who invented them. Instead of silicon, the Swiss scientist used titanium dioxide (TiO2), a cheap and widely available material. Grätzel cells work when particles of TiO2, coated with a dye that absorbs sunlight, are placed between two electrodes in an electrolyte solution containing iodine ions. The cells generate electrical energy when the energy captured by the dye makes the electrons in the dye molecules jump from one orbital to another. The electrons then jump onto the TiO2 particles and diffuse towards one electrode, while the iodine ions carry electrons from the other electron to regenerate the dye. Because of the low cost and general availability of materials in producing Grätzel cells, it is feasible that this technology can be implemented even in the poorest countries. 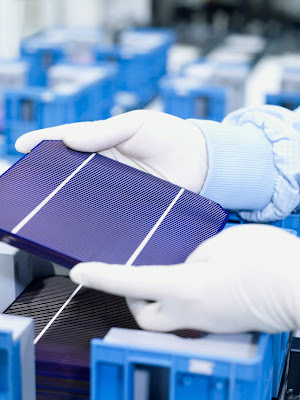 The limitations of conventional and current solar cells include high production cost, low operating efficiency and durability, and many cells rely on toxic and scarce materials. 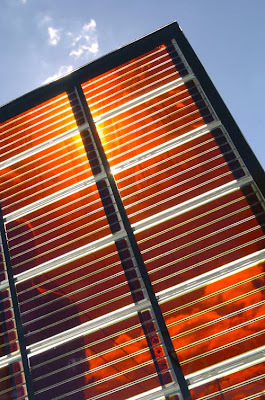 Northwestern University researchers have developed a new solar cell that, in principle, will minimize all of these solar energy technology limitations. In particular, the device is the first to solve the problem of the Grätzel cell, a promising low-cost and environmentally friendly solar cell with a significant disadvantage: it leaks. The dye-sensitized cell's electrolyte is made of an organic liquid, which can leak and corrode the solar cell itself. Grätzel cells use a molecular dye to absorb sunlight and convert it to electricity, much like chlorophyll in plants. But the cells typically don't last more than 18 months, making them commercially unviable. Researchers have been searching for an alternative for two decades. At Northwestern, where interdisciplinary collaboration is a cornerstone, nanotechnology expert Robert P. H. Chang challenged chemist Mercouri Kanatzidis with the problem of the Grätzel cell. Kanatzidis' solution was a. Thus, the new all solid-state solar cell is inherently stable. "The Grätzel cell is like having the concept for the light bulb but not having the tungsten wire or carbon material," said Kanatzidis, of the need to replace the troublesome liquid. "We created a robust novel material that makes the Grätzel cell concept work better. Our material is solid, not liquid, so it should not leak or corrode." Postdoctoral fellow In Chung in the Kanatzidis group worked closely with graduate student Byunghong Lee in the Chang group to develop the new cells, achieving performance gains that amounted to approximately 1 percent per month. In the Northwestern cell, a thin-film compound made up of cesium, tin and iodine, called CsSnI3, replaces the entire liquid electrolyte of the Grätzel cell. Details of the new solar cell -- an efficient, more stable and longer lasting cell -- will be published May 24 by the journal Nature. Kanatzidis, the Charles E. and Emma H. Morrison Professor of Chemistry in the Weinberg College of Arts and Sciences, and Chang, a professor of materials science and engineering at the McCormick School of Engineering and Applied Science, are the two senior authors of the paper. 1. Sunlight entering the cell strikes the dye molecules on the surface of the titanium dioxide. 3. The dye molecule strips an electron from iodide in electrolyte below the TiO2, replacing the one it has lost. 4. 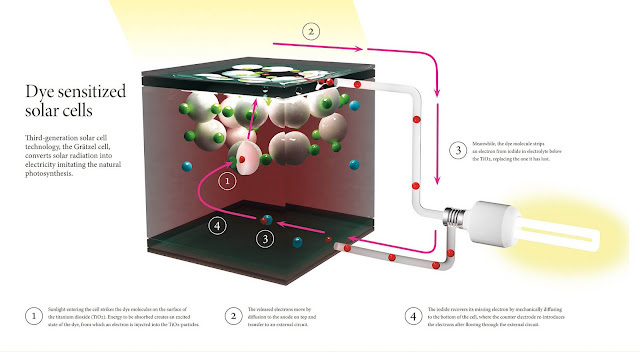 The iodide recovers its missing electron by mechanically diffusing to the bottom of the cell where the counter electrode introduces the electrons after flowing through the external circuit. "This is the first demonstration of an all solid-state dye-sensitized solar cell system that promises to exceed the performance of the Grätzel cell," Chang said. "Our work opens up the possibility of these materials becoming state of the art with much higher efficiencies than we've seen so far." Unlike the Grätzel cell, the new solar cell uses both n-type and p-type semiconductors and a monolayer dye molecule serving as the junction between the two. Each nearly spherical nanoparticle, made of titanium dioxide, is an n-type semiconductor. Kanatzidis' CsSnI3 thin-film material is a new kind of soluble p-type semiconductor. "Our inexpensive solar cell uses nanotechnology to the hilt," Chang said. "We have millions and millions of nanoparticles, which gives us a huge effective surface area, and we coat all the particles with light-absorbing dye." A single solar cell measures half a centimeter by half a centimeter and about 10 microns thick. The dye-coated nanoparticles are packed in, and Kanatzidis' new material, which starts as a liquid, is poured in, flowing around the nanoparticles. Much like paint, the solvent evaporates, and a solid mass results. The sunlight-absorbing dye, where photons are converted into electricity, lies right between the two semiconductors. Chang chose to use nanoparticles approximately 20 nanometers in diameter. This size optimizes the device, he said, increasing the surface area and allowing enough space between the particles for Kanatzidis' material to flow through and set. Technically, this new cell is not really a Grätzel cell since the hole-conducting material CsSnI3 is itself light absorbing. In fact, the material absorbs more light over a wider range of the visible spectrum than the typical dye used in Grätzel cells. In the Kanatzidis-Chang cell, the CsSnI3 plays an additional role in the operation of the cell that is not played by the liquid electrolyte couple, and that role is light absorption. "This is only the beginning," Chang said. "Our concept is applicable to many types of solar cells. There is a lot of room to grow." The lightweight thin-film structures are compatible with automated manufacturing, the researchers point out. They next plan to build a large array of the solar cells.